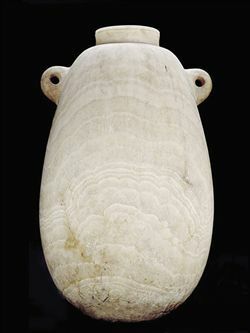 Big streaked alabaster vase, oval shape, with two handles. It was made in Egypt to keep wine and export it. The vase was reused by the Phoenicians as cinerary urn in their necropolis. It was found in the south of Spain, in the site called Torre del Mar (M laga), with the burnt remains of the deceased inside. PEREZ - DIE, Mª C., Egipto. Guía didáctica del Museo Arqueológico Nacional. I, 1985, P. 52. PEREZ - DIE, Mª C., Notas sobre cuatro vasos egipcios de alabastro procedentes de Torre del Mar (Málaga), conservados en el Museo Arqueológico Nacional de Madrid., Revista de Archivos, Bibliotecas y Museos, LXXIX, 4, 1976, P. 905 Figs. 1, 5 Lám. I.